Attach to your scratching post. Feather wand spins randomly to mimic prey. Redirects scratching from furniture. 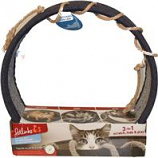 Entices and encourages cats to scratch during and after play. .
Toys made from natural materials such as sisal and hemp are safer for cat play. . . . .
• Multiple Textures and Streamers For Your Kitty To Bat and Chase For Hours! • Ball Has 6 Fun Tails For Kitty To Chew and Chase!